Yesterday we were finally blessed with a stunningly clear, sunny, and beautiful fall day. After a record amount of rainfall in the past month it was such a treat. It reminded me of all the things that I love about Fall. And taking family walks through the forest around our house is one of the things I love to do in the Fall. Perfect for this quick and easy project. 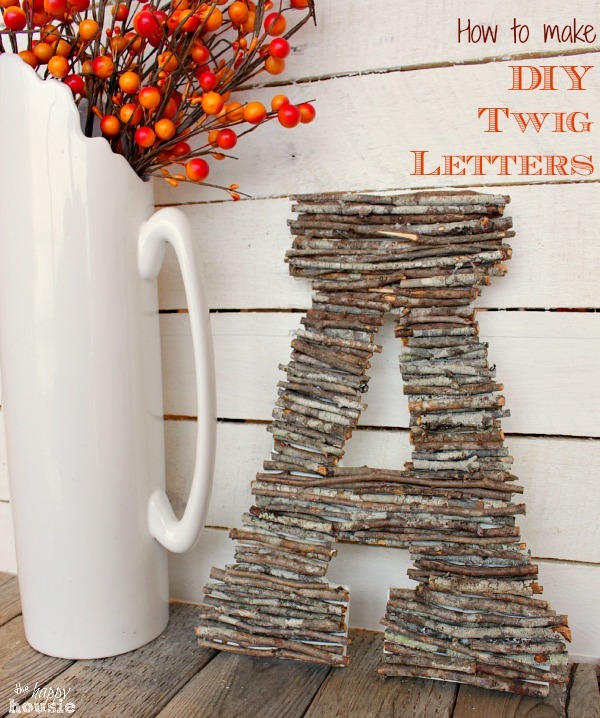 Today I can’t wait to show you how to make your these easy DIY Twig Letters for yourself. 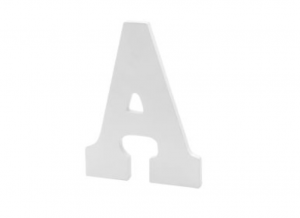 And I think that miniature versions of these would be adorable as place cards on your Thanksgiving table. As I mentioned, my youngest son and I went on a little adventure in the forest area around our house and cut and collected twigs. He was pretty excited about using the garden clippers. 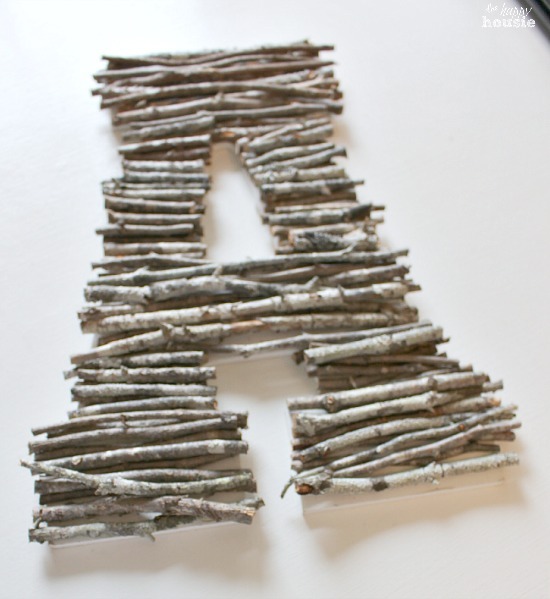 After we cut and collected all the twigs, I brought my wooden letter into the garage to help me cut the twigs down to size so that they would cover the letter. I placed them loosely on the letter as I went so as to make sure that I had enough for good coverage, overlapping them in some spots. Then I moved the whole production inside to a much warmer work area in my craft room and then used my hot glue gun to attach them to the wooden letter. It didn’t take very long…and once it was all glued with some overlapping twigs, you really don’t notice the white letter underneath. It seems perfect for Fall. I love how it looks against our late fall Mantel – I will be back tomorrow to show you some more of that. This month I have partnered up with some amazingly talented fellow bloggers for the ONE ITEM CHALLENGE. I love the project. But I really love that white pitcher vase. Any idea of where you got it? Hi Tatiana, I think I actually got it at Target a few seasons ago. Hope that helps! 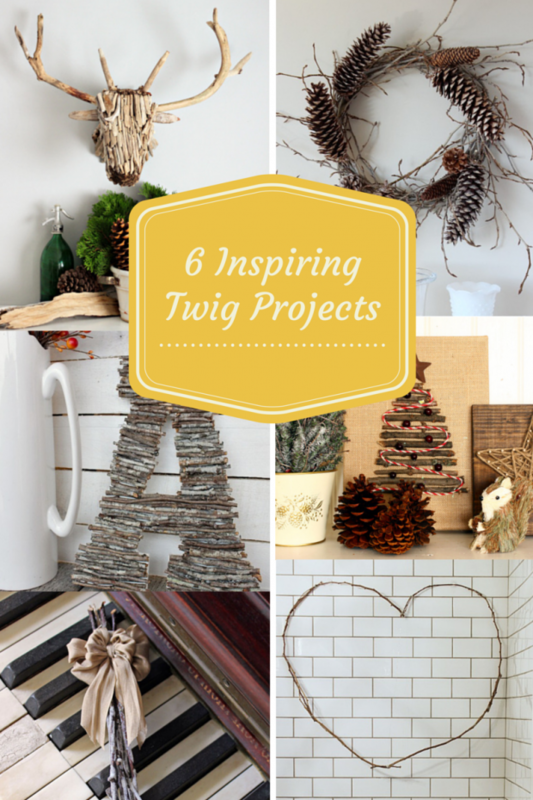 Love this twig monogram project. 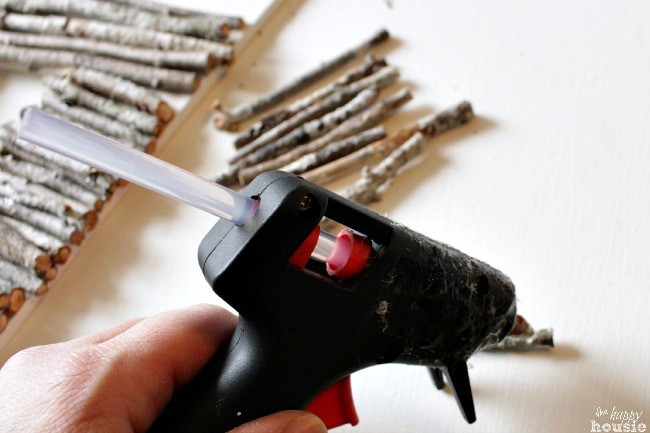 I have collected many twigs also from nature walks with grandkids. Look forward to trying it. Thanks for the information. It was a fun project, and a great way to add some natural texture into our home! Perfect project to do with children:) Enjoy! Love this. Is there a way we can do it without the wood letter? Hi Emily! 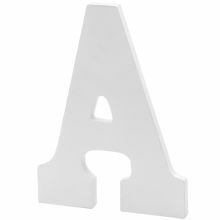 You might be able to if you use a letter A template (on paper or cardboard or something) and then glue the sticks to each other (above and below). Give it a go! Good luck with your project. I actually used white foam core for the back since I wanted to see if I could do the entire thing for nothing, just materials I foraged in the yard and in the garage. I used a yardstick to make sure the letter was straight and then used an exacto knife to cut it out. I don’t like the idea of the white showing through, so I am debating whether to glue a medium brown fabric from an old pillowcase over the foam core first. This is a great project. I am also glueing some juniper prunings with the berries on the springs, so hopefully as they dry, the berries will not fall off. Dried roses, especially red, are also in my mix, they are a deep deep red/purple/black on their long stem. Hi!! Love this. Could you tell me about those orange berries? Are they real or did you get in floral dept at craftstore. Thanks!! They are from my local dollorama, believe it or not! They are very realistic looking! I LOVE how simple yet adorable this project is! It is a craft that will get the kids out of the house and participate in. What an awesome idea your “ONE THING” project is too. If you ever love want to expand, I would love to join! Totally a great craft to involve the kiddos in!! Love this project! I have a series on my blog called “Saw It, Pinned It, Tried It” where I try out DIYs, recipes, etc from my Pinterest boards and today I tried this one out! There’s a link back to this post in there as well. Thanks for the great inspiration! 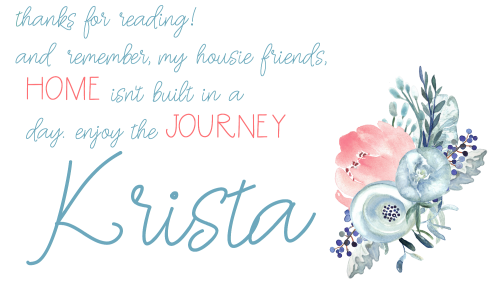 Love this, Krista! I love using nature in my decor, great DIY. I LOVE this craft. I am going to take a walk with my family and do the same thing (except with an “M”. 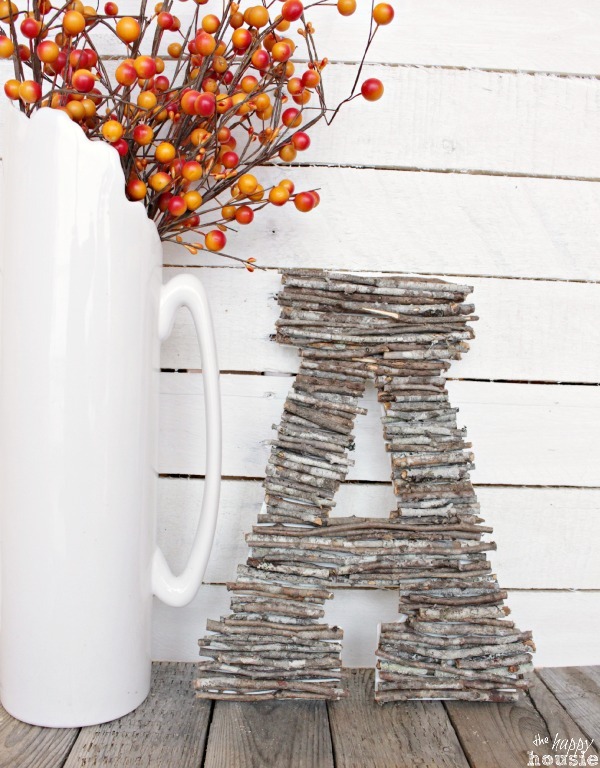 This looks great for fall, but I could see how it would fit with my decor almost all year long. You had a very clever, creative idea for the challenge. I’m looking forward to seeing what you do next! Looks great, Krista! 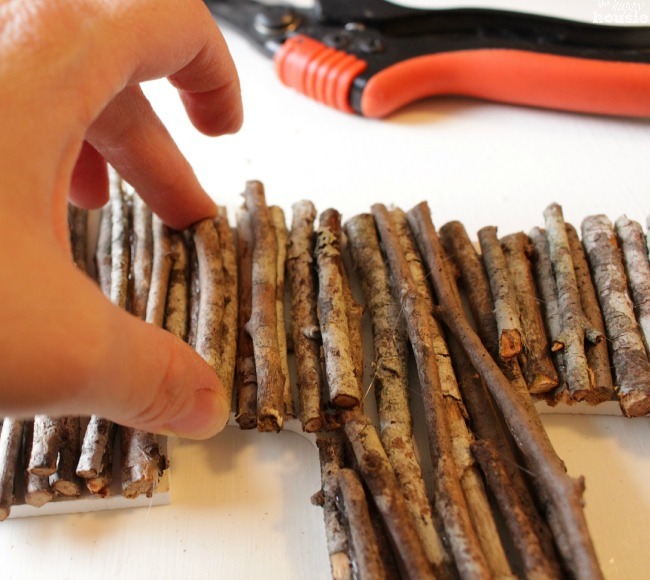 So many possibilities with this and an easy project to get the kids involved in too! That is such a great idea! I’m going shopping today in the woods! Oh so pretty Krista!!!! LOVE! love this idea and i love that it uses things that are easily found!